Penning began as a way for livestock owners to claim, brand, break and harness their loose herds. By the 1700's it had become an annual event, with eating and plenty of revelry by the entire community. 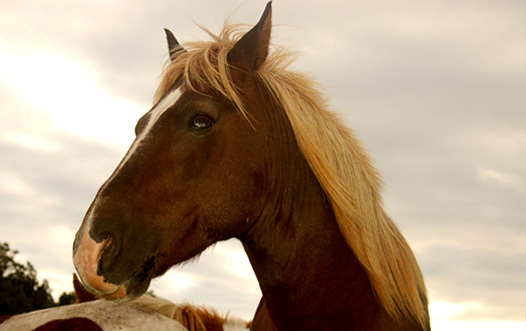 The earliest known description of Pony Penning was published in 1835. The practice was then already an "ancient" custom held in June on Assateague Island. Today's version of Pony Penning began with the formation of the Chincoteague Volunteer Fire Company. After a string of disastrous fires in the Town of Chincoteague, the villagers realized their fire fighting equipment was seriously inadequate. In 1925 the town authorized the Chincoteague Volunteer Fire Company to hold a carnival during Pony Penning to raise funds. That year over 15 colts were sold to benefit the fire company, and the carnival was a huge success. Bolstered by the interest in the pony swim, visitors began arriving from across the country for the annual penning. The crowd in 1937 was estimated at 25,000. 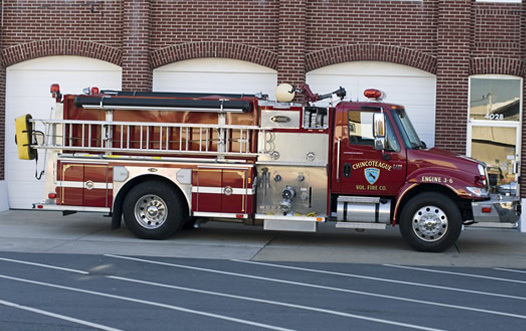 The increased revenue from the carnivals and auctions enabled the fire company to modernize its equipment and facilities, and in 1947 it began to build its own herd by purchasing ponies from local owners. 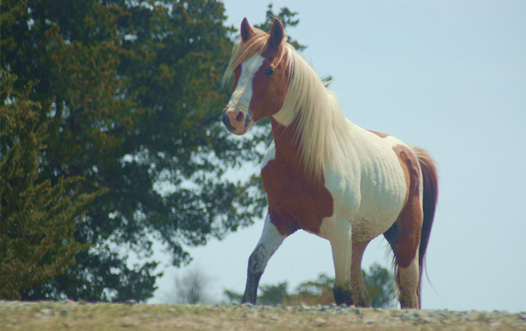 They moved the herd to Assateague where the government allowed publicly owned, not private, herds to graze on the newly established Chincoteague National Wildlife Refuge. That same year, 1947, Marguerite Henry published "Misty of Chincoteague," the story that made Pony Penning internationally famous. A movie followed, as did several sequel books. The tale of the wild pony Phantom, her foal Misty and the children who buy and raise her has become a classic, still loved and enjoyed by each new generation. 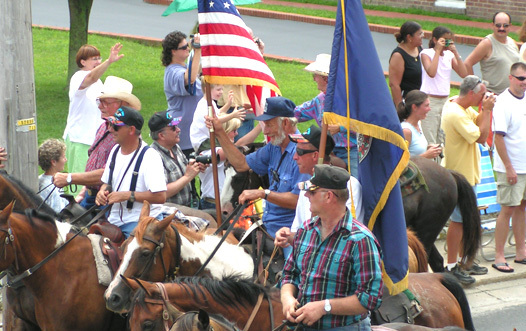 Pony Penning is still held in July during the Chincoteague Volunteer Firemen's Carnival. 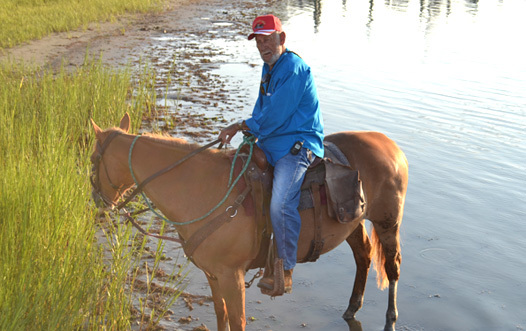 "Salt Water Cowboys" herd the horses across the narrowest part of Assateague Channel at low tide, after which they are examined by veterinarians. After a resting period, they are herded through town to a corral at the Carnival Grounds where they stay until the next day's auction. The Pony Auction not only provides a source of revenue for the fire company, but it also serves to trim the herd's numbers. To retain the permit to graze on the refuge, the herd must not exceed 150 horses. 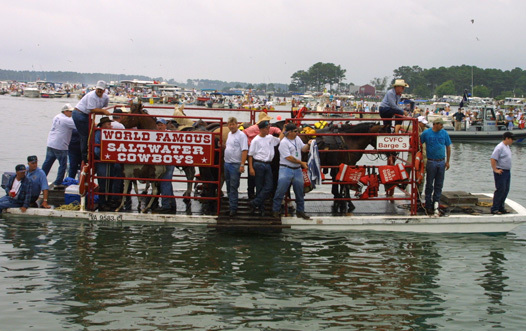 Each year thousands of people flock to Chincoteague Island to watch the Pony Penning and enjoy the Firemen's Carnival. For many of them, the trek to the shores of Assateague Channel on the last Wednesday and Thursday of July has become an annual event, an opportunity to participate in a tradition older than the country itself.